As Valentine's Day grows near, many of us are trying to plan a special day with our loved ones. Perhaps a romantic dinner without kids or just taking in a movie. If you live in Connecticut, I have a few unique and fun Valentine's Day date ideas for you, courtesy of the Connecticut Office of Tourism. My absolute favorite gift to get on Valentine's day is chocolate, and I know I am not alone. Why not take that to the next level and spend your day enjoying delicious chocolates from around the state? Connecticut is home to many chocolatiers and local chocolate artisans who serve up hand-made chocolate that melts in your mouth. CTVisit.com has put together a Connecticut Chocolate Trail list so you and your sweet can taste them all! My personal favorite is Bridgewater Chocolate - there chocolate is to die for. 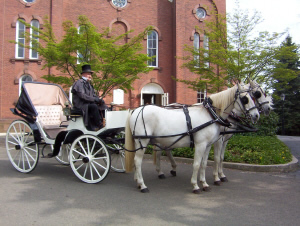 What could be more romantic than a horse-drawn carriage ride through the countryside? Nothing, that's what. At Allegra Farm you can enjoy a romantic ride while taking in the beautiful scenery. I suggest stopping at a Connecticut chocolatier first and enjoy eating that while in the carriage. Carriage rides are by appointment only, so reserve your spot soon. If you are looking for a truly romantic restaurant setting, than Apricot's Restaurant in Farmington might be a good choice for you. 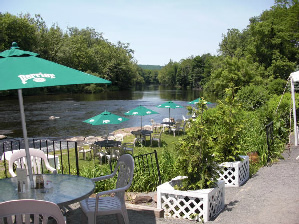 Located along the banks of the Farmington River, you can have a nice quiet meal with your significant other while overlooking the water. After you have enjoyed your chocolate, carriage ride and a lovely meal, you can finish the night off with a stop at Sea Tea Improv in Hartford for a little Valentine's Day fun. They have put together an improvised comedy show all about love and relationships just for this day. Spots are filling up quick so be sure to reserve your spot. This is just a taste of what Connecticut has to offer and you can find so much more at CTVisit.com. Do you know of any other great places to spend Valentine's Day in Connecticut? Please share them with me, I'd love to hear all about them.